The group includes members in their late teens through their 70’s. Practices include both sweep rowing and sculling. If you have a preference to focus on either sweep or sculling, please talk to the coach and they will do their best to accommodate you. Coached sessions focus on giving athletes a solid rowing foundation. 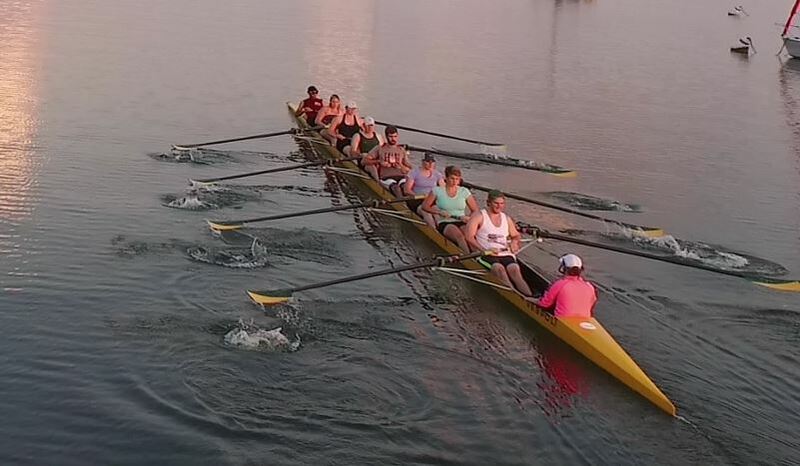 The expectation is that all are prepared to commit to rowing sessions that target improvements to technique, fitness and spirit, as well as rowing together cohesively as a group. Priorities include the teaching and practice of a consistent stroke technique, plus a team spirit that is fun and mutually supportive. Daily practice lineups and workouts are geared toward technical proficiency with the rowing stroke and crew unity. Workouts aim to optimize fitness, and minimize injury potential. There is no monthly erg test requirement for this program and there is no attendance requirement, though the more practices you attend, the more you will develop as a rower. You are welcome to join our club and our practices at anytime during the year. Our on water season runs from about April 1 to October 31 each year. We also have regular coached practices over the winter at our boathouse. MRC is currently seeking a coach for the advanced program. The water season at Mendota Rowing Club generally runs from April to the end of October. From November to March we offer winter training. More information about winter training is available here. Rowers must sign up for practice by 5pm the day before to allow the coaching staff time to put lineups together. Please make sure that the days that you sign up for are the days that you can come to practice. Your absence directly affects your teammates (especially those assigned to your boat). You are considered late if you arrive after the start time. The practice sign up sheet for members is located here. Coached practices are not open to members with an Independent Sculling Membership. You must have a full, novice, or monthly membership to participated in coached practices.